Supermodel got started. And I'm quite impressed at how far things have come. I have run into a rather serious bug while playing Ocean Hunter on Supermodel SVN 523(the most recent available build). Whenever I make it to Level 5(the North Sea), and get past the huge swarm of jellyfish, right when I encounter the level's miniboss, Medusa, the screen becomes a brownish-green color and I can't see what I'm doing. This has never happened to me in the past when playing Ocean Hunter on Supermodel, which leads me to believe that something's wrong with this particular build. 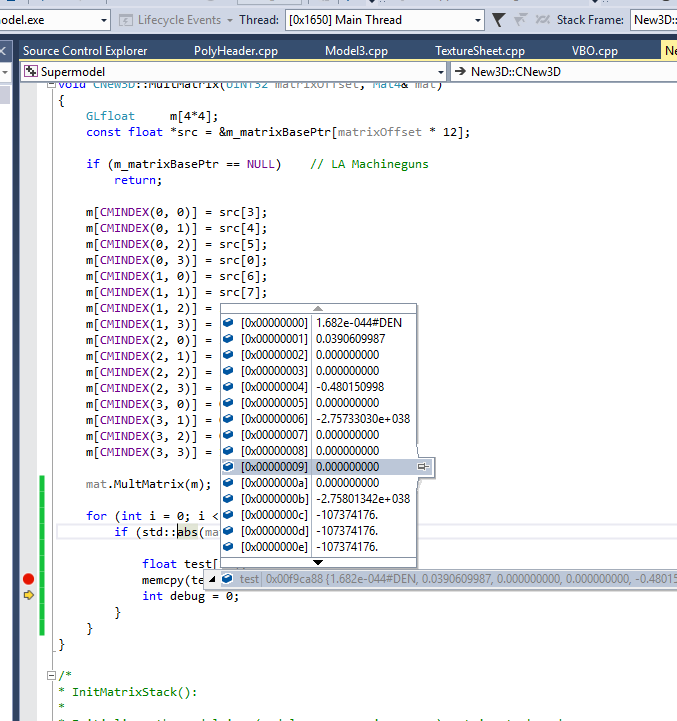 I've narrowed it down in that this problem only seems to occur on the New 3d Engine on the x64 bit version of r523. Hope someone can help me out with this. Interesting. Thanks for narrowing it down to the build number. It looks like this is when Ian introduced a fix for quad backface culling. I wonder if some giant quad is obscuring the screen that would previously have been culled away. Can you produce a save state just prior to this point in the game? Also, after a bit more research, I found out that this issue started sometime after SVN build 514 was created, since the next available build after that, which was r520, is the one where the bug started. Sorry for not pointing this out before. The far plane came out at infinity, so I guess nothing draws. I know roughly what the error is, so shouldn't be too hard to fix. The matrix for the some of the polys is bad. Unfortunately this blows up my near/far plane calculations. I could probably hack it with some sort of detection for this ..
Well I am glad that you found out what was wrong. But if you're not sure how to fix this issue like you said, then I'm guessing that's pretty bad news. What should I do in the meantime? Should I just wait for the next available SVN build to be compiled? I actually tried switching between the two engines while playing a little while ago, but unfortunately, it didn't work.